The meeting between President Putin and the pupils from the prestigious UK private school lasted for about 30 minutes and took place in late August, according to presidential press secretary Dmitry Peskov. In late August, 11 pupils from the UK’s prestigious boys’ private school Eton College went on a trip to Russia. The teenagers visited Moscow and St. Petersburg, met their Russian peers, and even had a chat with Russian President Vladimir Putin. 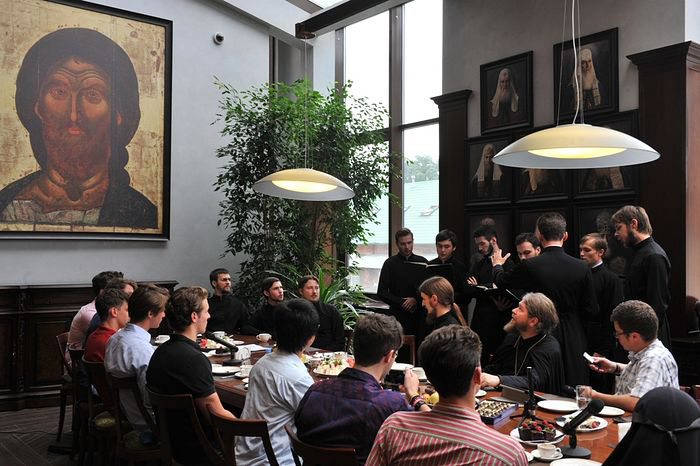 Bishop Tikhon (Shevkunov), Hegumen of Sretensky Monastery in Moscow, spoke to a correspondent from Orthodox website Pravoslavie.ru about how the trip was made possible and his impression of the young Brits. Question: Your Grace, back in March you were invited to give some lectures in Eton. Who was behind your visit there? Bishop Tikhon: As far as I know, the visit was the pupils’ idea, with their invitation later approved by the provost of Eton. Q: How were you received by the college? B.T. : They gave me a very warm welcome. After the lectures were finished, I was asked numerous questions about Russia’s history, its current situation, Russian and English literature and culture, and, of course, about the faith, the Orthodox Christianity. I must note one of the reasons why I was invited was because some of the pupils had read my book Everyday Saints, which has been translated into English. At the end of our meeting, the boys asked if I could help them with visiting Russia. I said that I would gladly extend my hospitality to them in Moscow and Stretensky Monastery. Then they asked if they could meet President Putin. That was an unexpected inquiry, to put it mildly. I responded by saying that pulling that off would not be an easy task at all. Then the boys asked: “Then what do we need to do?” “The same thing people do when they want to meet a person they are not acquainted with: Write him a letter and request a meeting,” I said. So the boys did just that, and I passed their letter – which was very polite and sincere – to the International Department of the Presidential Executive Office. Q: But some Western media reported the preparations for the trip were made in total secrecy. B.T. : This isn’t true. Right after I learned that the boys wanted to go to Russia and meet our president, I notified the Eton authorities about it. Also, before I passed the boys’ letter to the Presidential Executive Office, I asked for permission to do that from the college’s provost, and such permission was granted. Some time later, after the Russian side had already approved the meeting tentatively, Ambassador of Russia to the United Kingdom Alexander Yakovenko informed the Eton provost about the progress in the endeavor. The Eton authorities considered two options for the visit, letting them go as individuals on a private trip, or sending them as an official delegation, and eventually, they decided not to do it officially. After the boys learned about this, they said: “Then we’ll go by ourselves.” This is how they arrived in Russia. Their visit program included a brief stay both in Moscow and in St. Petersburg and some sightseeing. More importantly, though, they met their Russian peers. These were students from Lomonosov Moscow State University, people from some other universities that happened to be staying in Moscow during their summer vacation time, and students from our own Sretenskaya seminary who spoke English fluently. Then they had a meeting with the president, which was closed to anybody but Mr. Putin and the boys. We only know what exactly they talked about thanks to the revelations of the boys, since they published all their fresh impressions on social media. In the evening of the same day, we sent them off to St. Petersburg, where they stayed for a day and a half before going back to England. I think the boys were very happy with their trip. Based on their reactions, it made a great impression on them, and we were pleased to receive them. Q: The issue of who paid for the trip was also discussed by the media. B.T. : These were all children of wealthy parents, so there was no problem there. Besides, one of the Russian organizations involved in supporting student projects payed for the airline tickets – it was economy class, by the way – and simple rooms (it was a good hotel, but they gave great discounts). We at the Sretensky Monastery, were of course happy to have them over, and we set a table for them. The same goes for all the other places they visited. Q: What kind of impression did the young Brits make on you? B.T. : Well, we might have got lucky to have invited the right boys, but it will be no exaggeration if I say that they are the best of everything the United Kingdom makes today, the most respectable product to be released under the “Made in Britain” label. And in that sense, as a teacher and a provost, I can only express my admiration and respect for their parents, their teachers, and their mentors. Eton College is an outstanding school. The most striking thing isn’t even the ultra-high level of academic training they maintain, but rather the very efficient system of encouraging and developing the schoolboys’ creative talent. This experience deserves to be respected and closely examined on our part. At the same time, the young men are very open, sincere and modest (this last quality, as it turns out, is something that is fostered in Etonians intentionally), which breaks all our stereotypes about how prim and arrogant the pupils of the college supposedly are. For instance, they asked our seminary students to sing, and then they just stood up and started singing Jerusalem with them, this famous song that can be seen as an unofficial anthem of Great Britain. And you could see how this song touches the strings of their hearts. The trip was certainly a real adventure for the boys. And I would like to congratulate them: Their adventure was a success, and I believe it was interesting, important and unforgettable for them.